The lion has long been a traditional figurehead of ancient and modern China. Climb the stairs to the hallowed grounds of the temple and combine Chinese writings, and dragon statues to accumulate your fortunes in this oriental 5 reel slots. You're in the right place to find online video slots here now! Eyecon is building a huge reputation for being one of the leading games developers on the market and have certainly shown this by delivering an expansive Chinese themed game that’s full of both depth and character. After humble beginnings in 1997, Eyecon has gone from strength to strength providing some of the most loved games currently on the market. Find slot games here! Wu Shi Lion Dance has a substantial 25 paylines that operate across the standard set up of a 5 reel gameboard. Enable any paylines at any given time and place bets of up to £12.50 per spin, which is not something that the big money gamers may be interested in, but nevertheless, we all need to gamble responsibly. Despite the low betting thresholds, there are some brilliant opportunities to earn some great amounts of cash and prizes through the bonus deals. Looking for our top games? We have already taken care of compiling the best video slots online for your convenience. There’s a range of letters and symbols that make up the lower end of the spin line cash returns. Of course, you can stumble across the ancient Chinese artefact symbols of rising suns and gold pottery. The shrine and lettuce are among the highest paying symbols on this online slot game. In respect of this, standard game payouts are high and either of these symbols can see you making a return of 10,000x your initial line stake. Your wild is the lettuce and can be substituted for any symbol on the game, disregarding the golden lion, the red envelope and the crackers. Land on the ancient Chinese lettuce and all your prizes will be doubled. The symbols mentioned above are your scatters and each of them ignites their own additional bonus game that contributes to their own scatter combinations when 3 or more of these invaluable symbols are matched on the gameboard. There’s no denying that Lion Dance looks great. 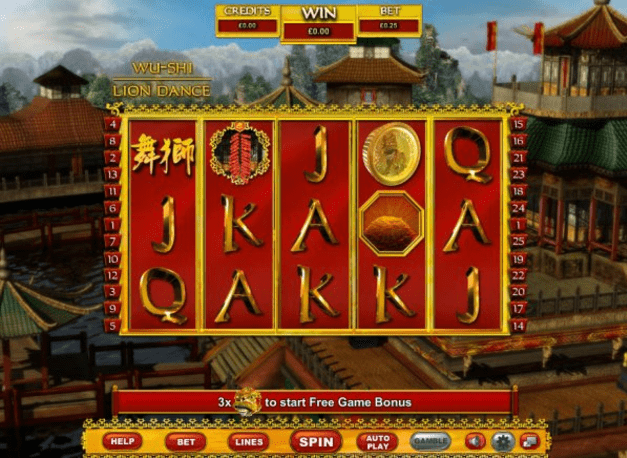 Take one look at the gameboard, the symbols and the enchanting Chinese village that is situated in the background and you will be instantly drawn into this online slot. This game endows itself with an exciting range of symbols that trigger numerous bonus game that offers the gamer a refreshing gaming experience upon every spin. There are free spins and cash prizes to be won when you play Lion Dance. Wizard Slots rates this game 8/10. Deposit now to earn your Chinese fortune. Another all action game to try is the wild wild west slot.